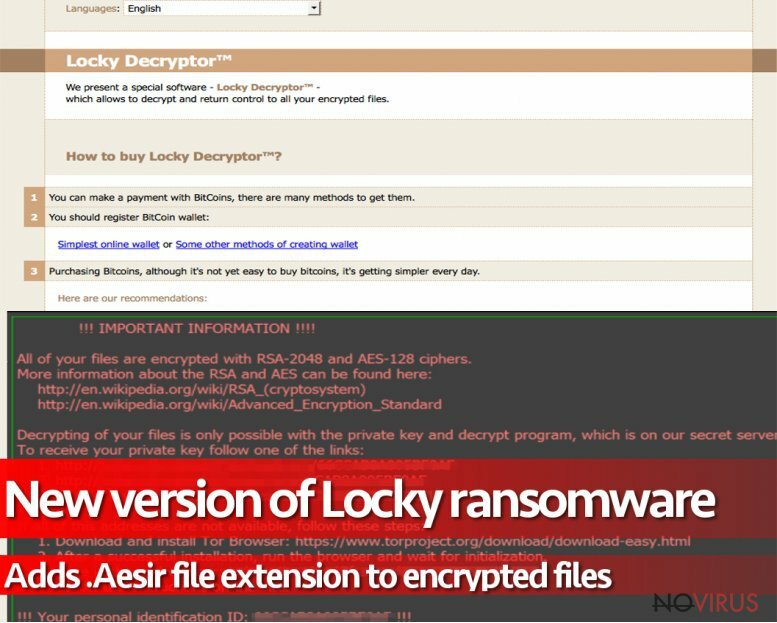 .aesir ransomware uses sophisticated techniques to infiltrate computers and hide from its victims. Use Reimage to determine whether your system is infected and prevent the loss of your files. Malware researchers has recently spotted a new version of Locky ransomware – .Aesir file extension virus. It is almost identical to Thor and Odin viruses; however, it seems hackers did a perfect job this time, and the latest version of malware is not decryptable. The virus also employs advanced distribution and infiltration strategies to lock personal files. It has been created to target about 456 file types and make them useless by changing filenames and appending .aesir file extension. Similarly to other versions of Locky, malware leaves a ransom note which includes the link to the payment site and asks for 3 Bitcoins to use Locky decrypter. If you do not have data backups, paying the ransom may seem like the only risky possibility to restore your files. However, before transferring Bitcoins, you should take into consideration the fact, that cyber criminals may not provide you a necessary decryption key. Therefore, you may end up with a money loss. At the moment 3 BTC equals to 1,775 GBP, so you have to decide if your files are actually worth risking this huge amount of money. Besides, if you have data backups stored in the external devices, you should not consider paying the ransom. However, it doesn’t matter if you have backups or not, you should remove .aesir file extension virus as soon as you see the first signs of the attack. Then, reboot your computer to the Safe Mode with Networking and scan the system with Reimage or other preferred malware removal program. Aesir virus encrypts files using a strong AES-1024 and RSA-2048 algorithms and corrupts almost all files located on the affected computer. During data encryption, it changes filenames with a random string of numbers and letters, and appends .aesir file extension. Indeed, it makes a chaos on the computer, and after successful file encryption, it drops _[ransom numbers]-INSTRUCTION.html and -INSTRUCTION.bmp files. The .html file is a ransom note, and the .bmp file is the new affected computer’s wallpaper which includes ransom demanding message. .Aesir ransomware drops the ransom note on the desktop and in every folder that has encrypted files. The message is identical to the Locky’s, Odin’s, Thor’s and Heimadll’s. Cyber criminals provide all necessary information about data encryption and decryption, provides links to purchase Bitcoins and install Tor browser. However, the most important link is the payment website where victims are offered to buy the possibility to decrypt files using Locky decrypter. It may be the only opportunity to restore data; however, our suggestion is .aesir file extension virus removal. Receiving ransoms is the motivation for criminals to continue their illegal projects. Aesir ransomware spreads via malicious spam email attachments and two malware distribution campaigns are already discovered. Cyber criminals may pretend to be representatives from Amazon and inform victims about dispatched order. The malicious email may be identified by the subject line ‘Your Amazon.com order has dispatched #[random numbers]’ and sender’s email auto-shipping4@amazon.com or auto-shipping5@amazon.com. Of course, the subject line may differ, and criminals probably have created hundreds of different emails, but keep in mind that emails from Amazon may be fake. Another malicious .Aesir virus distribution campaign is designed to trick users that they receive an email from their Internet service provider (ISP). Criminals inform that ISP has noticed that spam has been sent from this computer. These emails may be recognized by the title ‘Spam mailout’. Both of these malicious email campaigns send a .zip archive that includes malware. Therefore, if you receive a suspicious familiar email, do not rush opening the attachment, because chances to let ransomware in are high. Aesir malware may also be distributed via instant Facebook messages. Recently malware researchers spotted that Locky virus has launched a new distribution campaign on this social network. Ransomware sends an infected .svg file. When users click on it, they are redirected to the website that looks identical to YouTube; however, it has a different URL and is actually infected. This site delivers a pop-up that asks users to install a Chrome extension necessary for playing the video. If users install it, Nemucod Trojan gets inside the system and executes malware. Besides, ransomware also sends the same malicious message to the entire victims’ friend list. Therefore, if you receive a .svg file, you should not open it; besides, inform your friend about the infection. All variants of Locky ransomware are complex and strong computer infections, so you have to dedicate their removal for professional antivirus or malware removal programs. To remove .aesir file extension virus from the system, we recommend Reimage, Malwarebytes MalwarebytesCombo Cleaner or Plumbytes Anti-MalwareMalwarebytes Malwarebytes. Keep in mind that free or cheap security tools are too weak to wipe out ransomware from the computer. If you cannot install or access antivirus application, follow the instructions below. Malware tries to stay on your PC as long as possible; however, even the stubbornest ransomware can be removed from the system. After .aesir file extension virus removal, you can only restore your files from backups. Plug in an external device to the computer and copy necessary files. If you do not have backups, check additional data recovery methods explained below. Hopefully, you will be able to restore at least the most important documents. Sign in to your account and launch any Internet browser. Download a legitimate anti-malware software, for instance, Reimage. Make sure you update it to the latest version and then run a full system scan with it to detect and eliminate all malicious components of the ransomware to remove .aesir completely. In a new window that shows up, click the Next button and choose a restore point that was created before the infiltration of .aesir and then click on the Next button again. After restoring the computer system to an antecedent date, install and check your computer with Reimage to uncover any remains of .aesir. Using the tutorial provided above you should be able to eliminate .aesir from the infected device. novirus.uk team has also prepared an in-depth data recovery guide which you will also find above. If you do not have data backups, it may be impossible to decrypt files encoded by .aesir file extension virus. However, we do not want to encourage you to pay the ransom. Try other data recovery methods, and hopefully, you will restore at least the most important files. But keep in mind that making data backups is extremely important nowadays when ransomware attacks became so popular. Data Recovery Pro is a professional tool that has been designed to recover files after system wreckage, accidentally deleted files or encrypted by ransomware. Keep in mind that this tool is not specifically created to decrypt files corrupted by Aesir virus; however, it may restore some of the lost pictures, video, audio or other documents. It is strongly recommended to take precautions and secure your computer from malware attacks. To protect your PC from .aesir and other dangerous viruses, you should install and keep a powerful malware removal tool, for instance, Reimage, Malwarebytes MalwarebytesCombo Cleaner or Plumbytes Anti-MalwareMalwarebytes Malwarebytes. This post was published on 2016-11-22 at 10:21. Category: Ransomware, Viruses. You can quickly scan the QR code with your mobile device and have .aesir file extension virus manual removal instructions right in your pocket. What method did you use to remove .aesir virus?